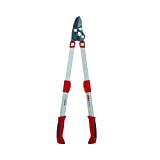 If you need to prune anything more than an arms reach away, you’ll need a pair of loppers, and there is quite a choice out there! As with everything ‘garden’ you will need to consider the type of job that you will be doing with your loppers. This comparison table shows the 10 most popular loppers currently for sale on Amazon in the UK. To skip straight to the buyers guide click here. Fear not! Here at GoTo4Gardening, we have completed the legwork for you and have created our own shortlist of the 10 Best Loppers 2018 that are available to purchase on the market today. Loppers don’t need to cost the earth even for a quality pair. We have looked at a variety of the best loppers available. Whatever your budget, there is something for you here. Loppers Type Loppers Name Where Can I buy? If you are in the market for a quality pair of all-rounder loppers that will satisfy your gardening requirements, then you won’t go far wrong purchasing a pair of these Spear and Jackson loppers. With a razor-sharp cutting blade and telescopic arms, these are the all-rounder loppers for you. The telescopic handles can range in length from 460mm to 720mm and lock in place with a simple twist mechanism. The non-slip grips help the user to work safely whatever the weathers. The ratchet action is a joy to behold; making cutting through the thicker stems a breeze. The cutting blades are made from c50 carbon steel and will last and last. The blade is PTFE coated; a smooth and rust-resistant gardening life awaits you! Spear and Jackson make quality gardening tools, and their 10-year guarantee is there should you need any reassurance. If your tool shed is missing a pair of quality bypass loppers, then look no further! These Wilkinson Sword bypass loppers offer the user a powerful and precise cut with minimal exertion. 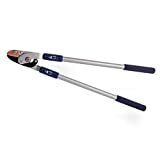 These bypass loppers are well known with the gardening community for their cutting performance and the outstanding build quality; they are also exceptionally lightweight. These bypass loppers will give a clean cut that is perfect when cutting back young, green wood with a maximum diameter of 3.5cm. 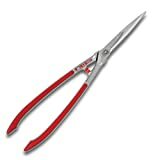 Bypass loppers provide a cut that aims to greatly reduce the bruising of green stems. During testing, it was noted that these loppers were a pleasure to hold and use with their delightfully soft grips. Wilkinson Sword is a high quality brand and offer a guarantee of 10-years. Spear and Jackson are well known for their quality gardening tools with a great build standard. It was a surprise to see that they had produced a pair on the budget spectrum under the bargain loppers category, but there they were in all of their bright blue glory! Yes, they are not a pair of your ‘all-singing-all-dancing’ loppers; they performed really well during our testing for lightweight and general pruning. While we were not able to test out their claim, Spear and Jackson are promoting the cutting blades as easy to sharpen and therefore should extend the life of these bargain loppers. There are some really nice features on these bargain loppers that really add to a quality feel. The handles are light aluminium, yet still retain a quality feel, and they are guaranteed for 10-years. 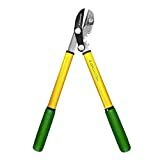 If you need a pair of bargain loppers to see you through light and general pruning in your garden, these are the loppers for you. If you garden anything like I do, the branch I reach for is always just that little bit out of reach! This countdown would just not be complete without GoTo4Gardening recommendation for the best telescopic loppers. In the past, I have used telescopic loppers and found that while they are fine when at their shortest length, by the time they are extended they are flimsy and, to be honest, they feel a little dangerous. These telescopic loppers, however, are a quality pair through and through. Their aluminium handles are confidently strong during use yet lightweight enough to be easy on your arms. The cutting blade on these telescopic loppers is made out of impressive SK5 Carbon Steel. The non-stick Teflon coating is a really nice touch, and you can really feel the ease of the cut. 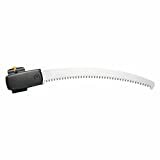 The handle easily locks in place, and the length ranges from 630mm to 950mm. With any gardening tool, the weight of the item is often key in choosing between two products. Draper have been making great headway in the manufacture of great value and quality garden tools, and these lightweight loppers are something else! You will find a lot of lightweight gardening tools being made out of aluminium, but the handles on this pair are made of fibreglass; now that’s what you call a lightweight pair of loppers! As well as being lightweight loppers, they are also really nice to work with, and the designers have worked hard to make the rubber grips ergonomic for a range of hand sizes. There are several nice touches with this pair of lightweight loppers that just adds to the quality. There is a rubber buffer that is designed to help prevent jarring between the handles. The cutting blade is made from well-designed SK5 Japanese steel. The cutting blade can easily achieve its 35mm thick branch claim. All in all, these are a great pair of lightweight loppers. Quality and value. The ‘strongest loppers’ was always going to be a hard title to live up to, but these Wolf Garten loppers are by far the strongest loppers we tested, well the manual ones anyway! The main reason why they cut so well up to and beyond 50mm thick branches, as far as we can tell, is the technology of the cutting head. There are two pivot points in the design. This gives these ‘strongest loppers’ quite some leverage in their use. As an aside, we love the colour combo of the Wolf Garten products and think that they look great! There is something quite beautiful about wooden garden tools, and these loppers with wooden handles are some of the best we have seen. As part of their heritage range, these loppers with wooden handles feature a non-stick cutting blade that has been hardened, tempered and finely ground to make the cut smooth; it works, and we loved it! For those of you concerned with the source of these loppers with wooden handles, the handles themselves are FSC certified solid ash. If you enjoy the feel of a wooden gardening tool, then these loppers with wooden handles are our choice for a best buy! When we started our research into loppers, these threw us a curved ball; powered loppers??!! Manufactured by Black and Decker (who else) this amazing machine features a 550w alligator powered lopper with a chainsaw cutting motion. While heavier than other loppers we reviewed, these powered loppers are easy to handle and don’t feel over heavy for their design and will happily slice through 4”/10cm branches. These powered loppers work in a scissor motion; your cutting and pruning will be completed in a flash! If you do select these powered loppers, we would remind you that appropriate safety equipment needs to be worn to protect the users. Black and Decker recommend safety goggles and gloves. 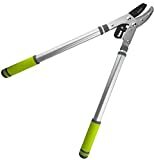 Ratchet loppers make cutting thicker stems a breeze these heavy duty ratchet loppers can easily chomp through 50mm branches however hard they are. The mechanical advantage of these ratchet loppers is aided by their spring-loaded cutting blade; use minimal effort for maximum effect! This is another pair in our series that have a cutting blade made from PTFE coated SK5 carbon steel, giving the blades a lasting sharpness and reduced friction while cutting. Spear and Jackson produce quality gardening tools, and these ratchet loppers are sold with a 10-year guarantee. “What on earth are anvil loppers?” Instead of a scissor close, anvil loppers meet when the cut is finished. These anvil loppers have steel handles that are tubular for maximum strength, yet they are not overly heavy either. The twist and lock handle mechanism also brings them into the category of telescopic loppers, but we felt that they were a better category winner for anvil loppers. Both of the blades are lacquered and polished, making the cut smooth and the blades highly resistance to rust. The soft feel grips are comfortable to hold, even for longer periods of time. Seen something you like on our list? Need some help searching for something slightly different? We’ve put together a loppers buyers guide that we hope will help you to make your final decision. Now you’ve read our selection of 10 best loppers 2018, you’ll have realised that there are many different factors that need to be taken into consideration when it comes to picking out the best loppers for your garden and gardening style. We have picked out the three most important things to consider when you are deciding which pair of loppers to buy; we hope our suggestions are helpful! When you are choosing loppers, you need to think about how strong you are and at what angle you are going to be using them. 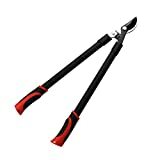 If you are going to be using loppers to cut stems and branches at knee level, then you will probably hold the loppers and let them hang while you use them. If, on the other hand, you are more likely to be using your loppers at head height, then you either need to be very strong or choose a lightweight pair. Don’t be put off straight away by the material that the loppers are made out of. Most online descriptions will tell you how heavy the loppers are, so this is the best way to compare them if you are not able to hold them. If you are going to be buying loppers online, then it is always good to check out the manufacturer’s website as well as the site that is selling them. The manufacturer’s sites, generally, will have more information regarding the dimensions of the loppers. Make sure you have as much information as possible about the weight of the loppers and about the grip size. If you know you have either very big hands or very small hands, it is well worth finding out about the diameter of the grips to make sure that they are comfortable for you to use. How much do good loppers cost? We have been surprised in these reviews just how much lopper you can get for your money. While it still holds true that you get what you pay for, you see to be able to get a lot with loppers! While it is easy for us to say, don’t just choose a pair because of the price. Think about and research exactly what you will need your loppers to do and then make the loppers to your criteria. The prices for the loppers we have chosen for our selection range from £10 to around £50, with the powered loppers coming in at £100. Finding the perfect garden tool for the job is never an easy task; there are so many choices out there! We made our choices based on the most common gardening tasks that people use loppers for, then designed the list around them. We hope that our shortlist has helped demystify some of the choices when it comes to loppers and that it has been helpful. Are you using an amazing pair of loppers that we haven’t shortlisted? Let us know!